FILE - Then-acting FBI Director Andrew McCabe pauses during a Senate Intelligence Committee hearing about the Foreign Intelligence Surveillance Act, on Capitol Hill, June 7, 2017, in Washington. Former FBI Deputy Director Andrew McCabe, who had been criticized publicly for months by President Donald Trump and was fired late Friday by the attorney general, has kept detailed memos of his interactions with the president, according to media reports Saturday. Attorney General Jeff Sessions fired McCabe, who had been with the FBI for more than 20 years, just two days before he was to retire. Sessions cited reports by the Justice Department inspector general and the FBI that found McCabe "had made an unauthorized disclosure to the news media and lacked candor — including under oath — on multiple occasions" as reasons for terminating "the employment of Andrew McCabe effective immediately." McCabe, who was at one time the No. 2 official in the agency, has been on leave from the FBI since January. He had planned to retire Sunday — his birthday — with full benefits. Now that he has been fired, however, some or all of his pension could be at risk. In a statement late Friday, McCabe called his firing "retribution," saying, "I am being singled out and treated this way because of the role I played, the actions I took, and the events I witnessed in the aftermath of the firing of [former FBI Director] James Comey." Special counsel Robert Mueller is investigating Russian influence in the 2016 U.S. presidential election and whether there was collusion between the Trump campaign and Russia. He also is investigating whether Trump's actions, including firing Comey, constitute obstruction of justice. Media reports say Mueller's team has McCabe's detailed notes of his interactions with Trump. 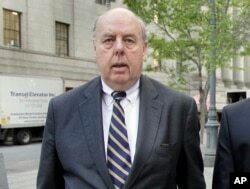 FILE - Attorney John Dowd is pictured in New York, April 29, 2011. John Dowd, Trump's personal lawyer, praised Sessions on Saturday for firing McCabe, and then suggested that Deputy Attorney General Rob Rosenstein, who oversees the special counsel, "bring an end" to Mueller's investigation. Shortly after McCabe was fired, the president praised the decision on Twitter, calling it a "great day for Democracy." Trump continued to tweet, chiding the media, saying they were "beside themselves that McCabe was caught, called out and fired." He also tweeted that the House Intelligence Committee had released a report concluding "there was no collusion between Russia and the Trump Campaign." Additionally, Trump called the former FBI director "Sanctimonious James Comey" and claimed, without providing proof, that McCabe "knew all about the lies and corruption going on at the highest levels of the FBI!" Comey tweeted back at Trump Saturday afternoon, "Mr. President, the American people will hear my story very soon. And they can judge for themselves who is honorable and who is not." Comey, who was fired in May 2017 by Trump, also kept personal notes of his conversations with the president. FILE - Former FBI Director James Comey testifies during a Senate Intelligence Committee hearing on Capitol Hill, June 8, 2017, in Washington. 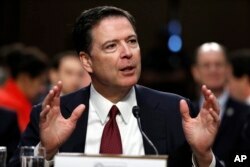 Comey testified before Congress in June 2017 that he believed Trump was trying to get him to drop an investigation of Trump's former national security adviser, and that White House officials had spread "lies, plain and simple," to cover up the reason for his dismissal. "There's no doubt that I was fired because of the Russia investigation," he told lawmakers, referring to the widening investigation of Russian meddling in the 2016 U.S. presidential election. American intelligence agencies have said the Kremlin attempted to assist Trump's electoral defeat of his Democratic opponent, former Secretary of State Hillary Clinton. McCabe was thrust into controversy just days before the 2016 presidential election when it was disclosed that his wife, Jill McCabe, a Democratic candidate for a seat in the Virginia Senate in 2015, had taken hundreds of thousands of dollars in campaign donations from a political action committee controlled by then-Virginia Governor Terry McAuliffe, a Clinton friend. Trump, then the Republican presidential nominee, used the disclosure to question the FBI's impartiality in investigating Clinton's use of a private email server, before it declined to bring criminal charges against her. At the time, the FBI said that McCabe had consulted bureau ethics officials and that he and FBI lawyers "implemented a system of recusal from all FBI investigative matters involving Virginia politics." But the controversy continued to dog McCabe after Trump abruptly fired Comey over the Russia investigation, a move that led Sessions to elevate McCabe to acting director. VOA's Masood Farivar contributed to this report.